Table below shows the scientists that contribute to the development of the Model of Atom. All atoms of a given element are identical, having the same size, mass, and chemical properties. Atoms of a specific element are different from those of any other element. Atoms cannot be created, divided into smaller particles, or destroyed. Different atoms combine in simple whole-number ratios to form compounds. In a chemical reaction, atoms are separated, combined, or rearranged. Atoms consist of even smaller particles called electrons, protons and neutrons. Atoms can be created and destroyed in the nuclear reactions such as nuclear fusion and nuclear fission.. Atoms of the same element can have different physical properties, for example, isotopes of hydrogen. The electrons were positioned uniformly throughout the atom. most of the atom’s mass concentrated in a tiny center, the nucleus and electrons being held in orbit around it by electrostatic attraction. The nucleus was around 10-15 meters in diameter, in the centre of a 10-10 metre diameter atom. Those alpha particles that had come into close proximity with the nucleus had been strongly deflected whereas the majority had passed at a relatively great distance to it. Electrons in an atom of an element are not randomly distributed around the atomic nucleus. Electrons move around the nucleus in fixed orbits. Each orbit forms a circle and has a fixed distance from the nucleus. Chadwick discovered the presence of neutrons in the nucleus. He concluded that the nucleus contains another tiny particle known as a neutron that has no charge. The neutron mass is almost similar to the proton mass. The central nucleus consists of protons and neutrons. It containing almost all the mass of the atom. Atoms are made up of tiny particles called subatomic particles. The proton and neutron form the nucleus at the centre of an atom. They are also called the nucleon of an atom. The electron moves around the nucleus at a very high speed. The nucleus is positively charged because of the presence of protons, which are positively charged. The neutrons are neutral. The symbols, charge and relative masses of proton, neutron and electron are as below. 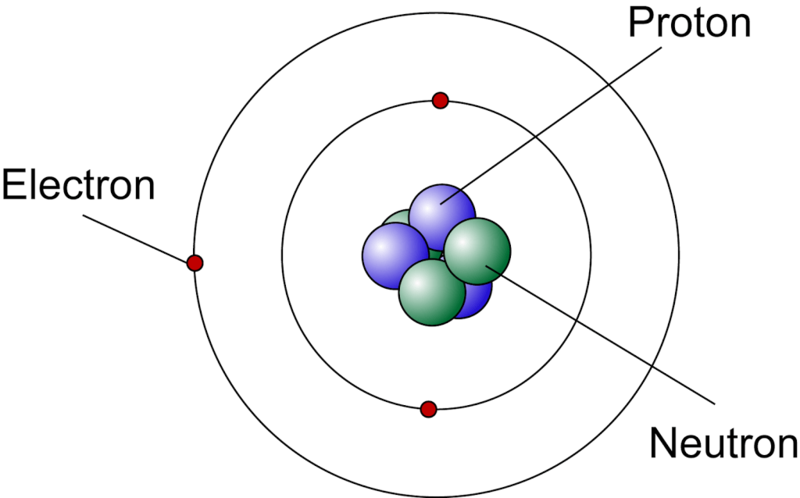 A neutral atom contains the same number of electrons as the protons. If the number of protons is greater than the number of electron, the particle is positively charge. The proton number (Z) represent the number of protons found in the nucleus of an atom. The proton number is also known as the atomic number. In an atom of neutral charge, the number of electrons also equals the atomic number. Hence, the proton number of an atom can also represent the number of electrons. The nucleon number of an atom is about the same as the mass of the atom because the mass of an electron is very small and can be ignored.